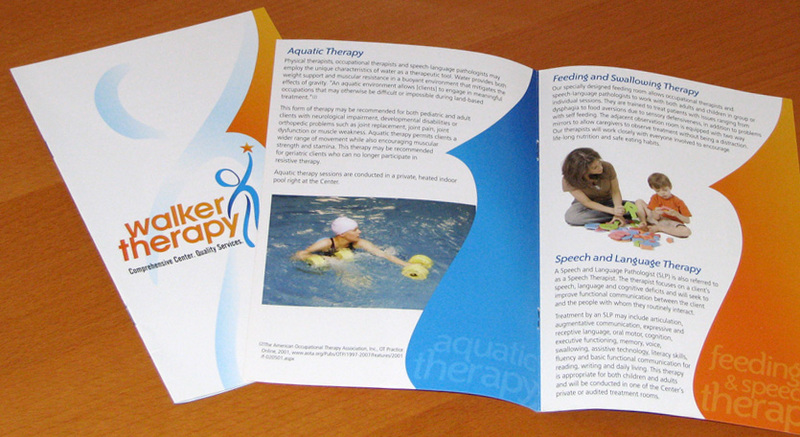 Brochure design plus brochure copywriting equals great marketing collateral. Walker Therapy is a full-service therapeutic center featuring equine assisted therapy and aquatic therapy. This brochure tells their story! Let us help tell your story. Brochures are all about communication. Often the most important things communicated by a brochure are non-textual. In many cases, the design itself has more of an impact than the words alone. A brochure’s graphics can inspire a sense of understanding and, when done correctly, can entice someone to engage more completely with your content. Your brochure acts as an ambassador for your business. It shakes the hands you don’t have time to shake. Why then would anyone settle for the cheapest or fastest solution to create a brochure? At Sillitto Design, we believe the development of a brochure is not a casual undertaking. Each stage, from the design to the printing, is addressed with reverence and care. We believe that the design of your brochure should cooperate with and amplify your overall marketing message. Sillitto Design is passionate about our brochure design service. Whether it is a small and affordable trifold or a large and elegant mail packet, we strive to develop the perfect visual accompaniment to your marketing message. If you feel your brochure is missing a great tagline, or if the content needs “a little punch,” we are happy to help with content development.